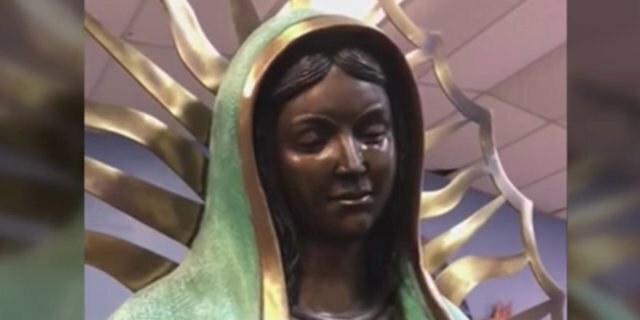 A bronze statue of the Virgin Mary at a church in New Mexico is “weeping” tears of olive oil — and no one can explain why. Leaders at Our Lady of Guadalupe Catholic Church in Hobbs, New Mexico, say people have come from all over the world to witness the statue cry. While leaders initially did not know what the liquid coming out of the statue was, an investigator with the Roman Catholic diocese of Las Cruces said that the Virgin Mary’s “tears” have the same chemical make up as olive oil. Olive oil, when blessed, is used as a sacred oil in the Catholic Church to anoint parishioners. Church leaders say they don’t know how or why the phenomenon is happening, if it’s happening naturally, or if someone is behind it. Deacon Jim Windor, who is the diocese’s vice chancellor and an investigator into the statue, said the first “lacrimation” occurred on May 20 and lasted five hours. The second appearance of tears was on June 2, when it was witnessed by at least 50 people, according to the Huffington Post . Oscar Cantú, the former Bishop of the diocese, said that investigators examined the interior of the hollow statue and found nothing. “There’s nothing on the interior that’s not supposed to be there, except for cobwebs. So we took pictures; we examined it,” he told the Las Cruces Sun News . He said he contacted the manufacturer of the statue, which is located in Mexico, for more information. Cantú, who was recently transferred to the diocese of San Jose, California, said the church is not ruling out the possibility of it being a hoax. If the church concludes that something supernatural is behind the crying Virgin Mary, it must also decide if it is a good or evil spirit. In that case, Cantú said that he would defer “the wisdom to Pope Francis” if he had to. As for whether or not it could be considered a “miracle,” decisions into deeming something a miracle often take decades within the Catholic Church.